Thanks for all the comments on gluten free baking yesterday. I have had much more success with my baking today! 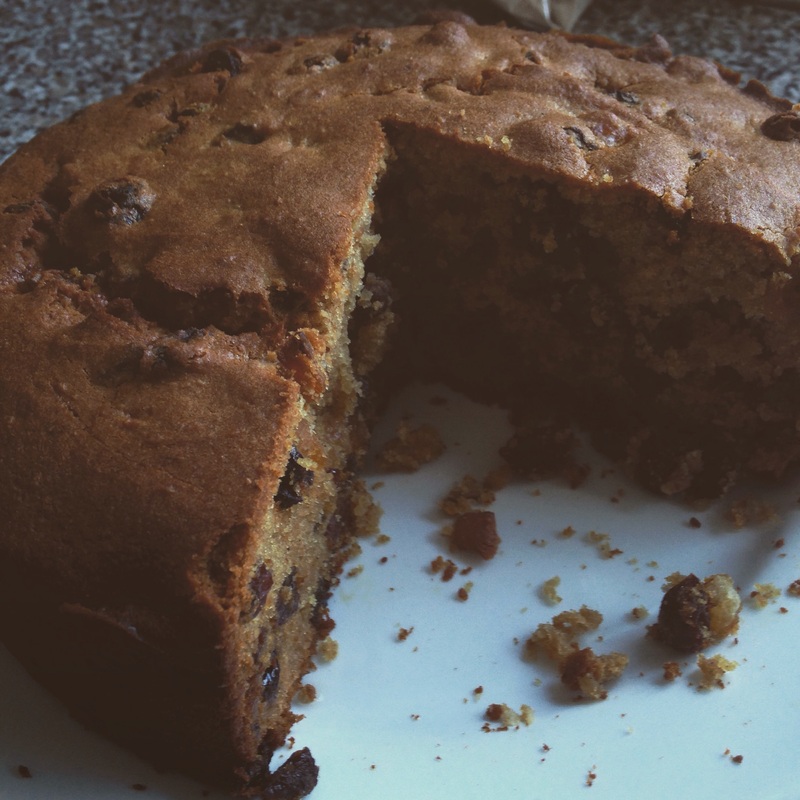 Today I made my favourite easy fruit cake. I make it about once a month. As suggested by Kate in the comments yesterday, to make it gluten free I substituted the wheat flour for 75% Dove’s Farm self raising and 25% ground almonds. I also added 1 fl oz more milk as I have read that GF flour can take more liquid than the regular stuff. The recipe was given to me about 15 years ago, and I have it stuck to the front of one of my baking books. It was a huge success in its gluten free form – as you can see, several pieces had gone before I even got round to taking the photo! Place all ingredients in a large bowl and beat well until mixed. Place the mixture in the tin and smotth the top. This easy fruit cake couldn’t be simpler and is fail safe as long as you don’t cook it too high. I also discovered that yesterday’s cheese muffins weren’t quite the disaster I thought they were. When they were hot, the feta tasted awful – really overwhelming. This morning, tasting one cold, they were much nicer. The recipe suggested refreshing them in the microwave for 30 seconds before eating, so I tried that and my muffin was really quite good. Better for lunch with some soup or a salad than the dry GF rolls I have been buying in the supermarket. I have frozen them in batches of six to take to work and left some out to eat over the weekend. Mr Shoestring and his brother spent much of the day on the roof finishing off. They have done a splendid job. The roof now appears to be completely water tight and cost about £200, rather than the £1500 we feared a roofer would charge us. Im glad you have had a bit more luck, I will be trying your recipe myself. GF bread I have struggled with but I recently found I can tolerate Khorasan bread, its an ancient grain wheat and hasnt been over refined and mucked about with so most people who cant take wheat are ok with this. You can get the flour in Waitrose or decent health food shops and the bread freezes really well.